devoted to the History of Sport, Physical Education, Recreation, Dance, Sport in Art and the Olympic Games. The IISOH plans to build a large sports complex with a research Library and Museum. The Museum includes several indoor and outdoor sports facilities which are designed to support the educational and research missions of the Institute. Most sports will have dedicated facilities that serve both as historical replicas as well as for contemporary training and competition. One could study the history and origins of a particular sport as well as the evolution and changes over time. Facilities will also be used for modern training and competition with special emphasis on research. 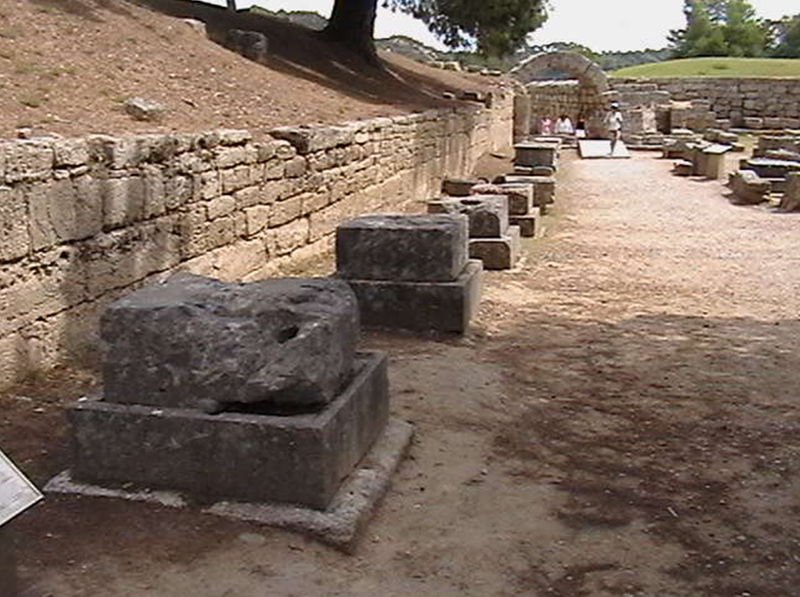 We plan to build only one stadium - a replica of the ancient stadium at Olympia, Greece. 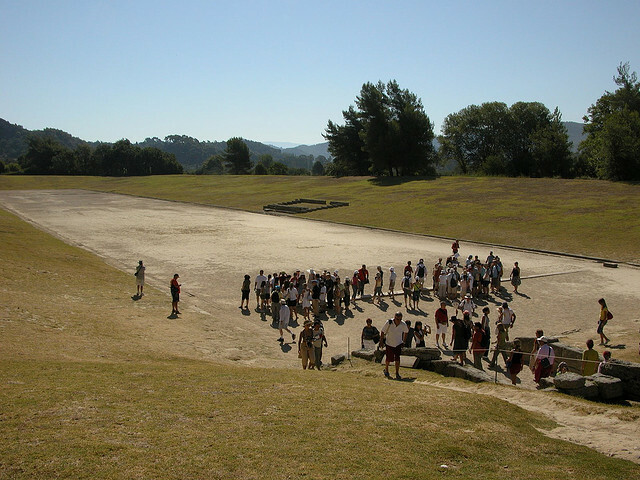 The ancient Stadium of Olympia with visiting tourists at the starting line made of engraved stones. 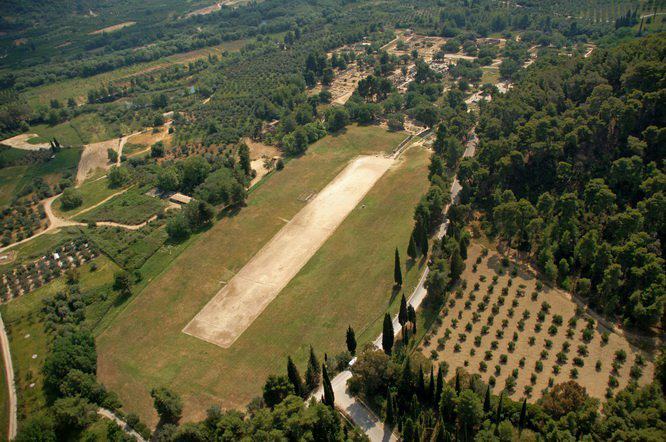 This stadium is a replica of the ancient stadium in Olympia, Greece. At that ancient site the Greeks celebrated their Olympic Games as part of a religious festival in honor of their primary god, Zeus, for almost 1200 years. The stadium was only part of a much larger religious sanctuary which included numerous buildings and a giant temple that housed one of the seven wonders of the ancient world, a huge statue of Zeus. We plan to build a replica of the stadium, the arched entry tunnel and the section for ZANES that led to the stadium entrance. The simple stadium design was a straight runway, a little over 200 meters long. The area surrounding the stadium did not have seats, just a sloped, grass covered area with room for an estimated 40,000 spectators. In the aerial view of the stadium below you can barely see the entrance to the stadium in the upper right corner of the field which also helps (a little bit) to give some perspective to the large size of this ancient stadium. On the right side of the image are many trees that cover the side of Mount Olympus. The Olympic religious site, with all the ancient buildings, is located in the top right half of this image, dotted with trees. If you look real close you can see a kid doing pushups. 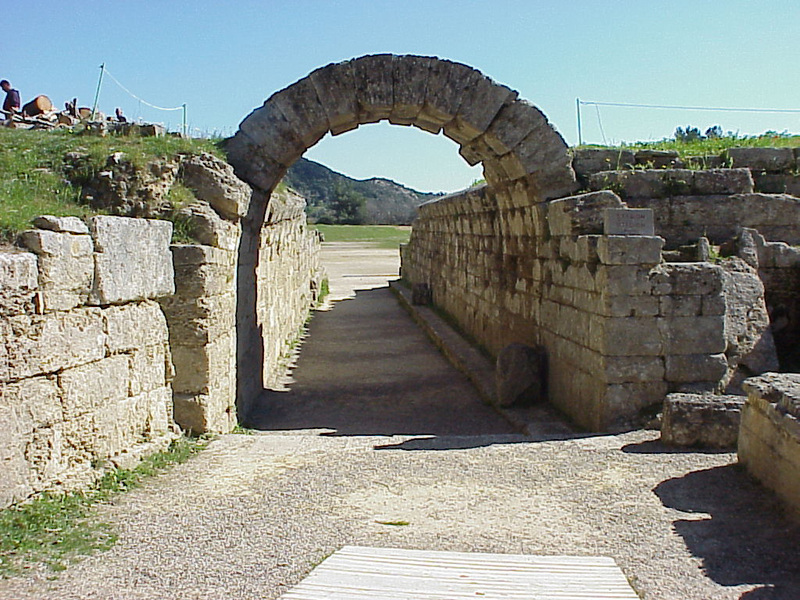 A small part of the entrance tunnel to the ancient stadium still exists today at Olympia. 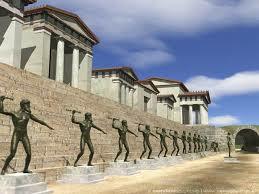 To the left, along a retaining wall, were a number of bronze statues known as the ZANES. To enter the stadium all the athletes had to walk past these statues, reminders that those who cheat or break the rules will be forever remembered here. It was a warning to the athletes to be fair and honest in the competition or fines would be issued and a statue erected for such infamy. These statues did NOT honor great athletes, they were permanent reminders of the cheaters. The ancient Olympics had some rules which we might have to adjust for the modern era. The ancient Greeks competed without clothing, completely naked. However the IISOH will require modern participants to wear some athletic clothing! The ancient Olympics did not allow women as spectators but that rule will also not exist in the IISOH stadium. We plan to use this facility for educational purposes, to recreate the ancient Olympic Games every summer - especially for school students, but also for the general public at large. 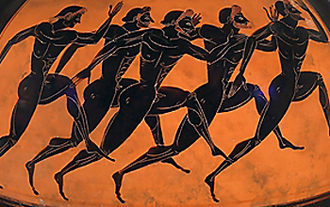 By participating in the ancient Olympic events we can teach the history of sport through participation, much more fun than looking at exhibits hanging on walls or inside glass cases. We want to recreate the ancient Olympic Games every week throughout the summer season to educate the world about the history of sport and the ancient Olympic Games. We expect you to be there, so perhaps you should start training! such as the stade race, a single run from start to finish. It is this ancient Greek word that gives us the English word STADIUM. Stade race - This was a sprint from the starting line to the finish line, 192 meters and was the only event at the first Olympic Games. The diaulos - a two-stade race - a sprint down the stadium track to the end and then back to the starting line, 384 meters total. The dolichos - a multi-stade race, and almost nothing is known about this distance, other than it was multiple stades from 7 to 24 lengths. The hoplitodromos - the Hoplite race, a race while wearing some armor and carrying a shield 2 or 4 stades. The Pentathlon - five events that included throwing the discus, throwing the javelin, jumping with halteres, running and wrestling. Other events took place outside the stadium such as chariot racing, horse racing, wrestling, boxing and the pankration. Pennsylvania has 12.5 million citizens in 67 counties. Within these 67 counties there are 501 school districts. re-creation of the ancient Olympic Games, it would take us 50 weeks! The IISOH primarily serves this market -- but that is just the beginning. It is a big world and we eventually will reach out to everyone. But not at first - we need to focus small - starting right here in Pennsylvania. research Institute with a permanent endowment of $300 million or more. Your enthusiastic support is welcome! under section 501(c)3 of the Internal Revenue Code. Donations are tax deductible.